Madagascar, is an island country in the Indian Ocean, off the coast of Southeast Africa. The nation comprises the island of Madagascar (the fourth-largest island in the world), as well as numerous smaller peripheral islands. A cataract is an eye disease in which the normally clear lens of the eye becomes cloudy or opaque, causing a decrease in vision. The lens focuses light onto the back of the eye (the retina) so images appear clear and without distortion. The clouding of this lens during cataract formation distorts vision. Cataracts are usually a very gradual process of normal aging but can occasionally develop rapidly. Cataract surgery is the removal of the natural lens of the eye (also called "crystalline lens") that has developed an opacification, which is referred to as a cataract. During cataract surgery, a patient's cloudy natural lens is removed and replaced with a synthetic lens to restore the lens's transparency. A few decades ago, this was a big procedure, as there would incision and patients would be advised on many things including how to sleep and avoiding oil bath etc., now a days, cataract surgery does not even need hospitalization, some enter the hospital, have the surgery performed and simply walk out ….it is done with laser, minimally invasive, small incision surgery – that has changed the way of cataract surgery. As a result of the island's long isolation from neighboring continents, Madagascar is home to an abundance of plants and animals found nowhere else on Earth. Approximately 90 percent of all plant and animal species found in Madagascar are endemic, including the lemurs (a type of prosimian primate). The word "lemur" derives from the word lemures (ghosts or spirits) from Roman mythology and was first used to describe a slender loris due to its nocturnal habits and slow pace, but was later applied to the primates on Madagascar. 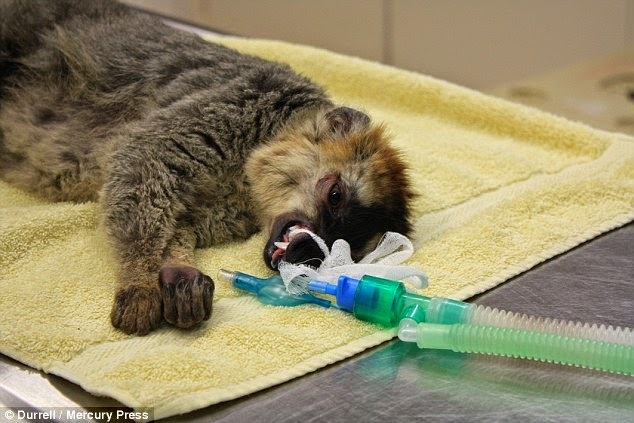 It is the story of a blind lemur which can now see again thanks to British vets who saved his sight with pioneering two-hour operation to remove cataracts….. read this interesting post excerpted from Daily Mail. Four-year-old animal Sam lost his sight at Durrell Wildlife Park, Jersey; Two British vets flew from mainland to help in first operation of its kind. The same vets have helped elephants, bears, lions and eagles see again. 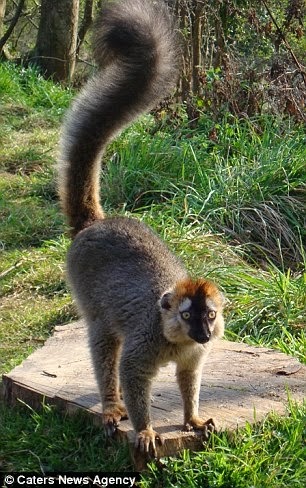 Keepers at Durrell Wildlife Park in Jersey first noticed Sam, a four-year-old red-fronted brown lemur, had inflamed eyes in January - and within weeks he had been blinded by cataracts in both eyes. The normally social animal was left unable to interact with his troupe and had to use his memory to navigate round his cage, until he became trapped up a tree and had to be rescued. Distressed keepers called on the help of the British Animal Health Trust (AHT), whose vets have previously saved the sight of elephants, bears, lions and eagles. 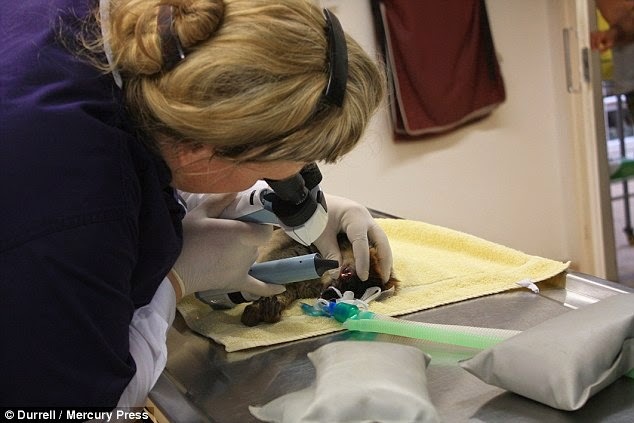 In the first operation of its kind on a lemur, vets Claudia Hartley and Rachael Grundon flew from the mainland and spent two hours painstakingly removing the cataracts last month. Just six weeks later, Sam has made a remarkable recovery and is once again socialising with other primates at the animal park, including his parents Matz and Millie. The lemurs of Madagascar are reportedly at risk of extinction in some areas due to habitat destruction, hunting and trapping for food and the pet trade. There are 106 known species of lemur, but 90 are classified as being near extinction because their numbers are so small. Despite being a national symbol to many, the animals are the most hunted in Madagascar.